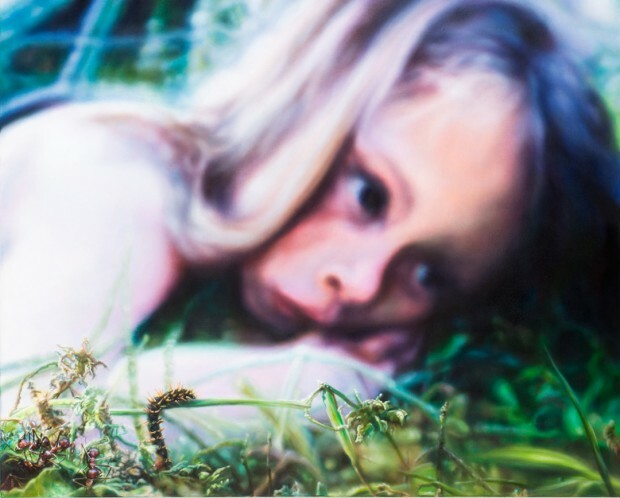 TORCH Gallery presents an interesting exhibition called The Shapeshifter, where a series of beautiful paintings by Anya Janssen is showcased. It’s difficult to capture the feeling I had when looking at her paintings, which are full of discrepancies: innocence and eeriness, both comforting and sinister. Subtle elements within the works make that you don’t feel totally at ease. Like a caterpillar crawling in front of the view while a child is lying behind it. The paintings lure you in with their overall sweet colours, expert technique and execution. They’re painted in a soft focus which melts the foreground and background together. Still, you keep having the feeling something is wrong with the situation portrayed. Or it will soon go wrong. Go check it out, the show is on until the 7th of April.